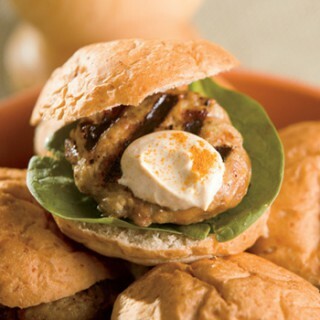 Add some Moroccan spice to ground chicken for flavorful sliders with a cool yogurt sauce. Nutrition Highlights: Greek yogurt used in the sauce for these sliders contains more protein than regular yogurt. In a small bowl, whisk together the eight Moroccan spices. In a separate bowl, combine Greek yogurt and 1½ teaspoons Moroccan spice mixture until blended. Refrigerate yogurt sauce until serving time. In a medium bowl, combine ground chicken, dates, walnuts and remaining Moroccan spice mixture (roughly 1 tablespoon) until well blended. Form into 8 mini patties about 2½-3 inches in diameter each. Grill chicken sliders 5-7 minutes or until a meat thermometer reads 165 degrees. Serve sliders on mini-burger buns with 1-2 tablespoons spiced yogurt sauce on each burger. For true authentic date enjoyment, choose fresh Medjool dates (from Morocco typically) rather than prechopped, packaged dates. Medjool dates are sold in portioned, small containers or by the pound in bulk. You’ll usually find them in the produce department. Choose dates that are shiny, uniformly colored and not broken. Store them at room temperature in an airtight container for several months or refrigerate for up to one year. Fresh Medjool dates can be finicky to cut and chop because they’re so sticky. 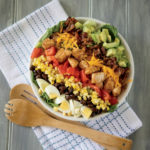 Use a very sharp knife, straight or serrated blade, and toss the chopped pieces with a smidgen (¼-½ teaspoon) flour to keep them from sticking together. They’ll blend with the ground chicken better and stay separated, too. This looks so incredibly yummy! Can’t wait to try it! Found you at Totally Tasty Tuesdays. I actually have all of these ingredients… including the dates that I bought yesterday. Pinning and making soon. Thanks for bringing this to foodie friday.